Roland DG Corporation announced the launch of the VersaStudio BT-12 desktop direct-to-garment printer for printing directly on cotton-based products, the fabric must be 50 – 100% cotton. Built for on-demand personalisation, the BT-12, which will be available from April 2019, is ideal for businesses looking for new revenue opportunities by offering an engaging in-store experience for their customers. 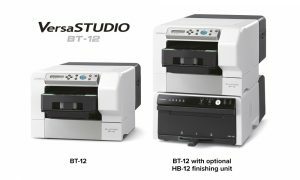 The BT-12 can be used as a standalone in-store personalisation solution, or as a complement to Roland’s VersaStudioBN-20 printer/cutter, VersaV-LEF Series UV-Led printers and the LD 80digital foil decorator. These solutions not only help to add value to merchandise, but also provide customers with a rewarding new shopping experience.